“I love poetry/poets which guide my thoughts into new directions. Dr. Sengupta is one such poet. With “Beyond the Eyes” he painted a picture in my mind using colors I’d never seen before. Quite an achievement considering the poem’s brevity,” wrote Gary Manz, a friend and poet, as he shared his review of Healing Waters Floating Lamps on Amazon on July 18, 2015. Healing Waters Floating Lamps, a collection of my poems, was released in March the same year. I can remember I dedicated this book to the legendary Tagore who continues to amaze me with the profundity of his poems even now. 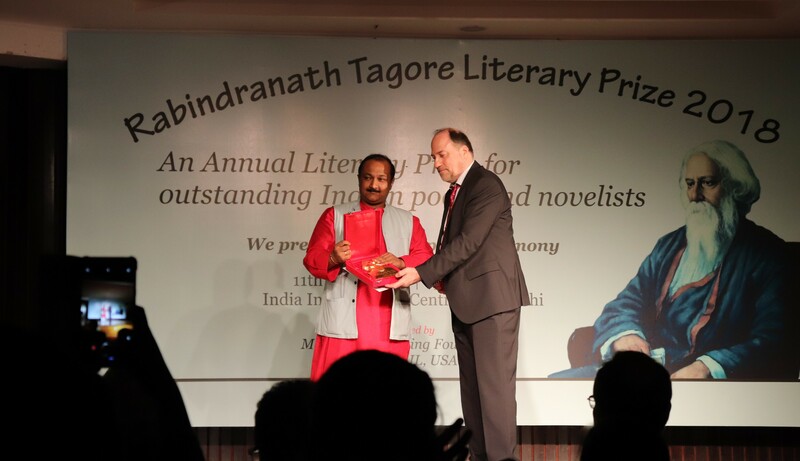 Little did I know the book would fetch me the Rabindranath Tagore Literary Prize (2018), awarded by Peter Bundalo, Founder and CEO of Maitreya Publishing Foundation (Chicago, Illinois). Honestly, I was a little doubtful in the first place. What struck my mind first was the authenticity of the mail and whether the awarding committee was aware of my works—my books, to be precise. Until then I was not aware of such a publishing concern in the United States, nor did I know if they had bothered to buy my book to read and assess my potential for the shortlist. After all, the names of the other shortlisted authors appeared alluring: Jhumpa Lahiri, Tishani Joshi, Amish Tripathy, Anita Nair, Vinita Agarwal, among others. Peter Bundalo belongs to Copenhagen (Denmark), and his first mail bore his telephone number. To get the ifs and buts resolved I called him straightaway only to hear that he has bought a copy of Healing Waters Floating Lamps on Amazon and he has been genuinely impressed by the spiritual connotations of my poems, himself being an ardent follower of Kriyayoga. I was taken aback from hearing his generous comments and decided to attend the prize distribution ceremony which was scheduled to be held in India International Center in New Delhi on April 11. Bitan Chakraborty, a friend and publisher of much renown and well-known Bengali story writer to his credit, accompanied me to the venue. A hall packed with the audience wasn’t something we had dreamt of, however, as we have witnessed, the organizers left no stone unturned in inviting people from different spheres of life, and they made sure not a single chair would remain vacant for the ceremony. Yes, it was a congregation of more than one-hundred people! Interestingly, all the shortlisted authors were declared winners; we were given a certificate of merit, a statuette of Rabindranath Tagore and a check prize of five-hundred US Dollars. A big deal indeed! Did I deserve all these? Really? But then, I’ve a few healers handy: I’m not a Lahiri, or Tripathi, or Joshi. Other than a Pushcart or Best of the Net nominations (in the United States) nobody had considered me for a literary prize in India. All the publishers I’ve worked with (Hawakal, Transcendent Zero Press, Inner Child Press, to name but a few) are essentially small presses (although they have never charged me a publishing fee). Last but not the least, I’ve my share of critical acclaim which one can only dream of achieving in a life-time. Do I sound like a narcissist? I’m but a poet, come on! What else? I’m plain happy. And I’m even happier to note that Jagari Mukherjee, fellow poet and critic, won the first prize in the book review contest (Mukherjee was given a prize check of US $ 100.00) for critiquing Dreams of the Sacred and Ephemeral (Hawakal, 2017), a book I authored. Let me tell you, this book is supposedly the first poetic trilogy in Indian English literature, and it has been reviewed both nationally and internationally in several major journals and newspapers.